Stephen Hawking speaks at the 2010 Television Critics Association Press Tour in Pasadena, California. Stephen Hawking's final paper was just published by his colleagues in the pre-print journal arXiv. The team had completed the research a few days before Hawking's death in March. This idea posed a problem: During its lifetime, the black hole swallowed a lot of information in the form of celestial objects, but where did that information go? The laws of physics dictate that no information should be lost: If information existed in the past, we should be able to recover it. Hence, the paradox. In 2016, Hawking and his team proposed that black holes might have "soft hairs" made up of photons (light particles), or gravitons (hypothetical particles of gravity) that store at least some of this information, Live Science previously reported. These soft hairs surround the black hole's "event horizon," — a boundary beyond which nothing, not even light, can escape. In the new paper, Hawking and his team found a mechanism — which relies on as-yet-unproven assumptions — for counting the amount of information that soft hairs can carry. "It agreed with the famous formula now inscribed on Stephen's headstone," senior author Andrew Strominger told Live Science in an email. The formula he is referring to is known as "Hawking's equation," and it describes how black holes emit Hawking radiation. When a black hole swallows an object, its temperature should change, which means its entropy — or the disorder of its particles — must also change (higher temperatures mean particles move around more rapidly, which means more disorder). In the new study, Hawking and his colleagues showed that "soft hair" can indeed record the entropy of a black hole, according to The Guardian. 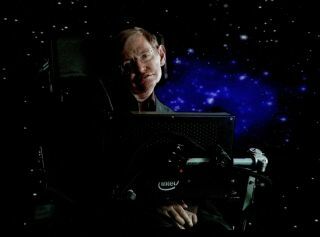 Another one of Hawking's colleagues, Malcolm Perry, a professor of theoretical physics at the University of Cambridge, told The Guardian that the late physicist "knew the final result" of the work before he died and that when Perry explained it to him a few days prior, "he simply produced an enormous smile." There is still much unknown about how these soft hairs store information and whether they store all or only some of the information gobbled up by black holes. "This is excellent progress, but we have much work yet to do," Strominger said.